This is your basic yellow leopard gecko with black spots. They will be inexpensive and very common in pet stores and photos depicting leopard geckos. Don't pay a lot of money for a Normal morph seeing as they are readily available. Before there were over 100 different color morphs there was just High Yellow. You either had a Normal or you had the High Yellow morph of the leopard gecko, nothing else. The High Yellow has more yellow and fewer spots than the Normal morph and you can have a combination High Yellow with another morph such as Jungle. An Aberrant leopard gecko is one that has a broken pattern, meaning if your gecko has beautiful bands all down its body and tail but there is a break in the pattern where an oval appears instead of a line you have an Aberrant. You can also have a combination Aberrant with other morphs. This is a completely patternless leopard gecko and is very similar to the Murphy Patternless. Blizzards can be all white, yellow, or even a purple color with the darker colors being referred to as Midnight Blizzards. Blizzards are one of the three morphs that also have eclipsed, or completely black, eyes. To be considered a Hypo a leopard gecko must have 10 or fewer spots on its body (some on the head and tail are allowed). If a leopard gecko has no spots on its body at all it is considered a Super Hypo. The Tangerine morph is any leopard gecko that has orange on it. Tangerine is often used in conjunction with another kind of morph such as a Super Hypo Tangerine. This morph description is specific to the tail. 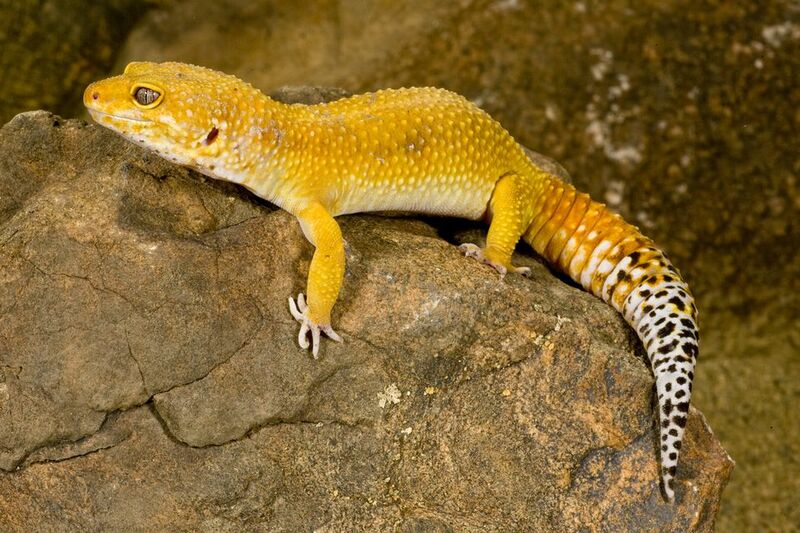 A leopard gecko that has at least 15% of its tail covered in orange is described as a Carrot Tail. The RAPTOR is an albino leopard gecko with red eyes and an orange body. RAPTOR morphs will have no black spots and are considered combination morphs. The Halloween Mask morph has bold head patterns. Their patterns and traits will continue to develop as they mature into adults. As the name suggests, the Lavender morph describes any leopard gecko with the light violet or lavender color on it. Many geckos lose their lavender coloration as they get older which can make breeding for this morph very difficult. A Hyper Melanistic is a darkly pigmented, but not black, leopard gecko. This morph has more melanin than the lighter pigmented morphs. It will still have spots and patterns but overall have a much darker coloration than Normal or Wild Types. This morph describes a leopard gecko that has a stripe all the way down his back, from his neck to his tail. The color of the stripe will vary but the Reverse Stripe description will be used in conjunction with other morph names. While the majority of morphs describe skin coloration or the eyes of a leopard gecko Super Giant is referencing the size of the gecko. Super Giants are the largest of the leopard geckos with an almost 12-inch gecko holding the record. Giants are bigger than Normals but smaller than Super Giants. This is a type of Super Hypo that has no spotting on its head. Other types of morphs also exist and while the combinations of them seem endless there are breeders who have this down to an exact science and are currently working on new morphs. Prices will vary from morph to morph depending on how difficult it is to produce but expect to pay a few hundred dollars for some of the more rare morphs. If you aren't sure what morph is your favorite a great place to view a variety of them is at your local reptile show.